BALANGIGA, Eastern Samar- President Rodrigo Duterte witnessed the turnover of the three historic bells named after this town as he urged the townfolks to secure the historic bells. The President arrived at the venue of the turnover rites about an hour late from his 4 pm schedule which was attended by US officials, Filipino and American veterans, Cabinet members led by Defense Sec. Delfin Lorenzana, and Church officials led by the papal nuncio, Archbishop Gabrielle Caccia and Davao Archbishop and president of the Catholic Bishops Conference of the Philippines, Romulo Valles. “I am sure that our ancestors are celebrating with us here on this remarkable victory. And that it does not only bring back the glory of the town, but also contributes to the full restoration of our dignity as a Filipino,” Mr. Duterte said on his six-minutes speech he read during the rites held at the town’s covered court which is adjacent to the St. Lawrence The Martyr Church where the bells were turned over immediately after the civilian rites. “I therefore trust that our kababayans in Balangiga and the rest of our country would ensure the protection of these gems are continued to preserve and promote our culture and history,” the President added. Mr. Duterte also said that no single individual could claim on the responsibility for the return of the bell carted away by the Americans 117 years ago. 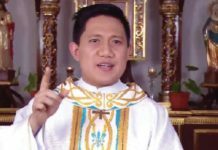 “The bells are returned and it was really because of the fervent prayers of the entire Filipino nation, period,” he said. The bells, two of them were displayed at F.E. Warren Air Base in Wyoming, USA while the other one was displayed at Camp Red Cloud located in Uijeongbu City, South Korea, were used to signal the attack of the local guerillas against the US troops which resulted to the death 48 American soldiers. During the program, US Deputy Assistant Secretary of Defense Joseph Felter, who represented US Defense Chief James Mattis, greeted the villagers “Merry Christmas” as he presented the bells to the ecstatic and tearful crowd gathered at the venue. “We hope you will ring in the church of Balangiga once again uplifting and gracing us all with the voices of our better angels,” he said. The three bells arrived in Manila on December 11, after it was transported by “The Spirit of MacArthur,” a plane named after the legendary American General Douglas MacArthur who led the liberation of the Philippines from the Japanese occupation during World War II. “MacArthur famously kept his promise to return to the Philippines. This week, MacArthur returned again this time with the bells,” Felter said. For his part, John Law, chief of mission of the US Embassy to the Philippines, said that the return of the bells underscores the enduring friendship of the two nations. “Many Filipinos of good heart and good will work tirelessly for decades for the return of the bells. The bells are home now in Balangiga where they belong. These bells are yours,” he said. He also thanked the American veteran groups who lobbied hard on the return of the bells. While Law admitted that the bells “regrettably caught up in the conflict” during the Philippine-American war, he said two countries have now become partners and allies. “Our relationship has withstood difficulty and it flourishes today,” Law said. 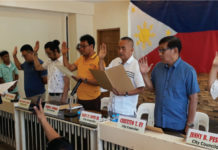 Church leaders in the Diocese of Borongan also expressed gratitude to both US and Philippine government officials who lobbied on the repatriation of the bells. “Please be assured that we will return the bells to their original purpose, and care and cherish them for its precious legacy,” said Bishop Crispin Varquez of the Borongan Diocese, in his speech during the rites, said. “We courageously express our commitment that we will do everything we can that these bells will not be separated from us again. They will remain in this church. Never again, Balangiga, these bells will be taken away from you,” the bishop said. Town Mayor Randy Graza, who received the bells from Defense Sec. 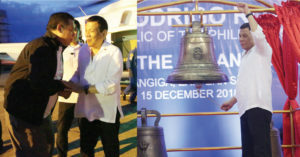 Lorenzana, said that they are just too glad that the bells were finally returned to them. “The Balangiga Bells have returned because of goodwill. The Balangiga Bells will not ring again for what it tolled 117 years ago,” Graza said. Meanwhile, Rolando Borrinaga, historian and one of the campaigners of the bell, said that the repatriation of the bells should paved the way for an unapologetic manner of celebrating the Balangiga Encounter. “We will celebrate as a victor. We won against a powerful enemy, we won against ourselves and our limitations,” Borrinaga said. He was also hopeful that because of Balangiga is now in the limelight, this can also “generate tourism” to the town.